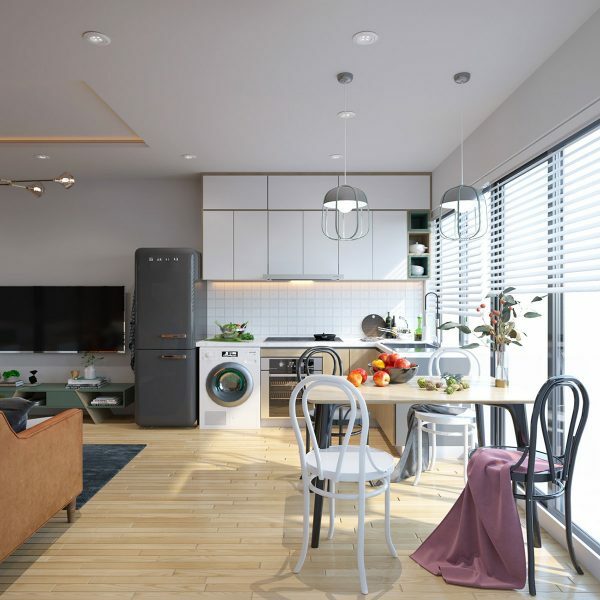 Small studio apartments have the bedroom area situated right alongside the kitchen diner and lounge area – usually without divide. 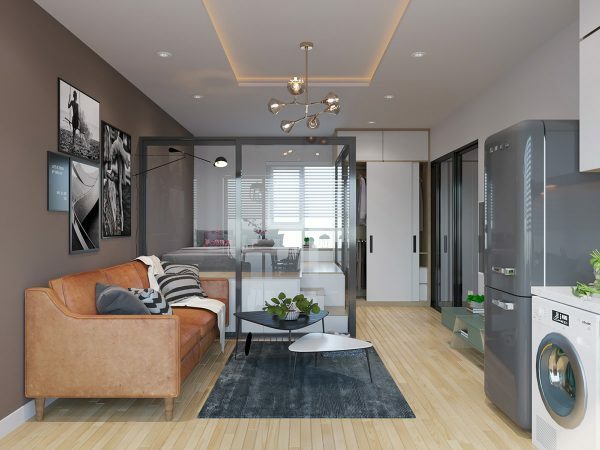 However, these compact open plan homes use glazed panels and doors to create separated glass wall bedrooms. 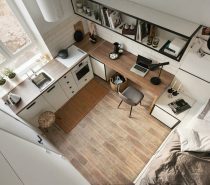 The clear nature of the medium means that the sleep space can still be viewed as part of the whole, thus maximising the compact dimensions of the space. 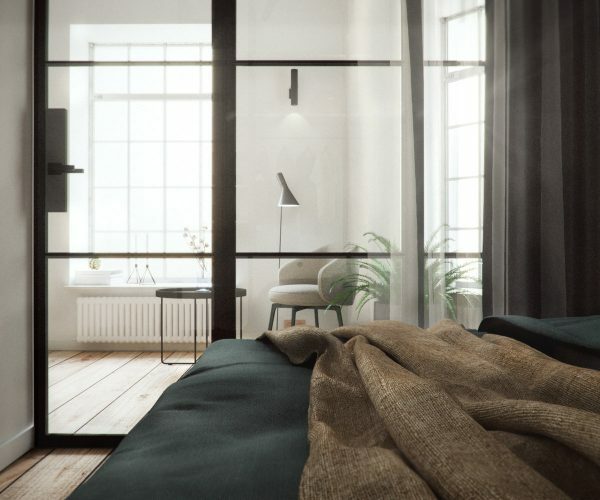 A glass bedroom partition not only makes the change of purpose clear cut, but also creates a light cocoon around the sleep space to give it the feeling of a safe haven; they can even help reduce noise to aid better sleep. 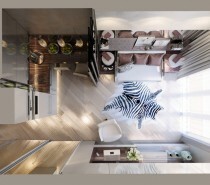 Our first apartment is located in the heart of St. Petersburg, Russia, with an area of just 46 square metres. 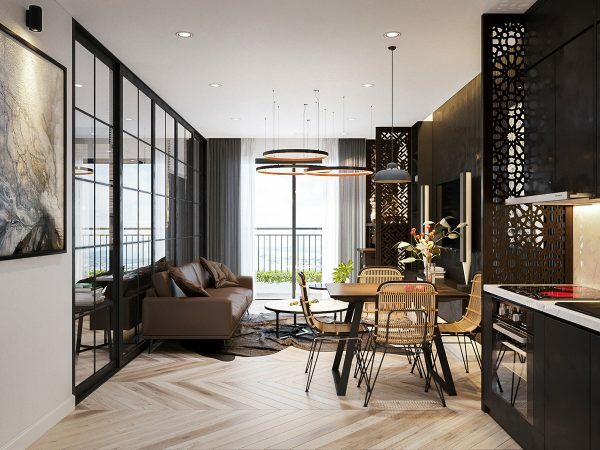 Sombre accents of deep bottle green and black contrast against a pure white decor scheme. A swing arm wall lamp is the Flos Mod 265 lamp cuts across a gallery wall where artwork introduces new hues, including a vivid run of yellow. 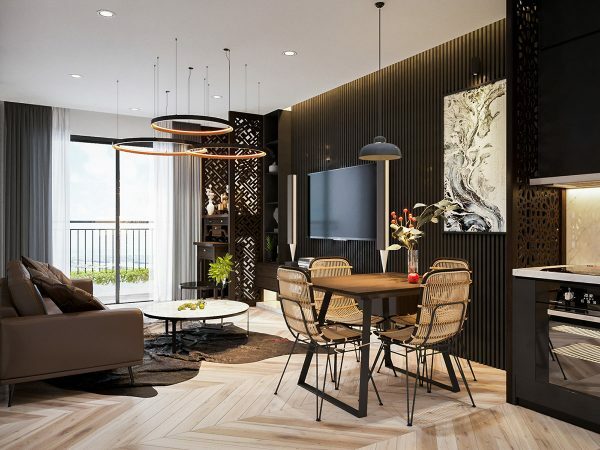 For more ideas like this, check out these living rooms with large wall art. Behind the solid gallery wall, retractable glass doors give entry to the bedroom area. 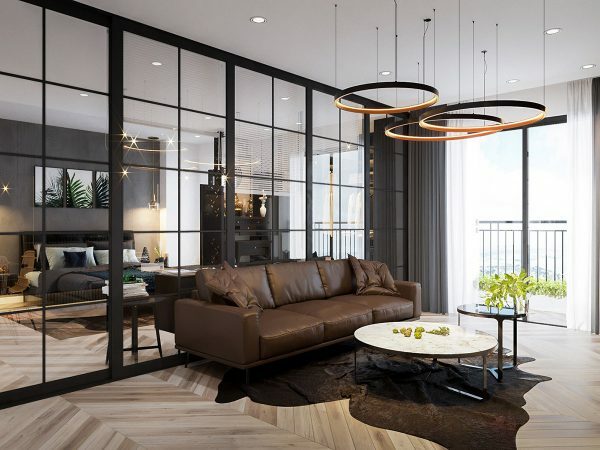 Glass panels take the divide all the way to the ceiling. 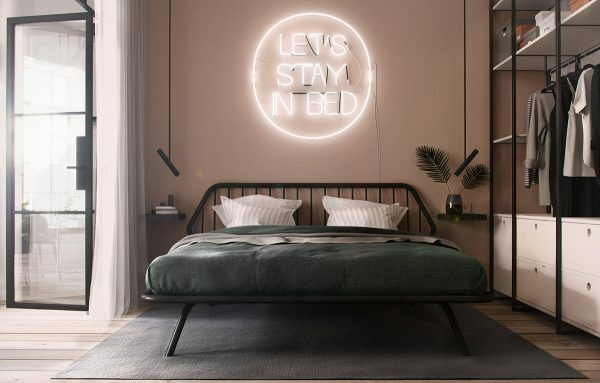 The headboard wall is decorated with a large bedroom neon sign, whilst the bedsides are lit by modern bedroom pendant lights. 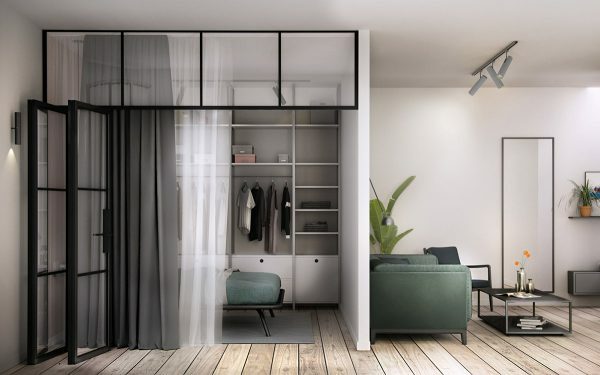 A closet system spans one entire wall, with shelves and rails left open to the room. Depending on how much light and privacy is required for the time of day, a selection can be made between sheer window voiles or heavy drapes to veil the bedroom. 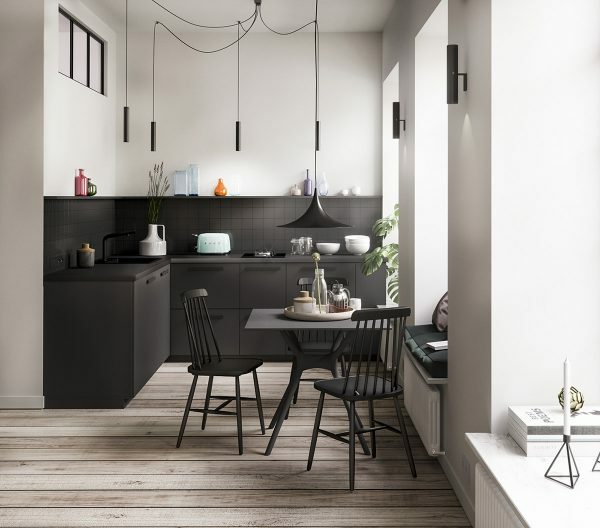 A black kitchen diner occupies one corner of the apartment. Tubular kitchen pendant lights are strung out around the prep area from one central ceiling outlet. A window seat acts as a space saving banquette bench in the dining area. 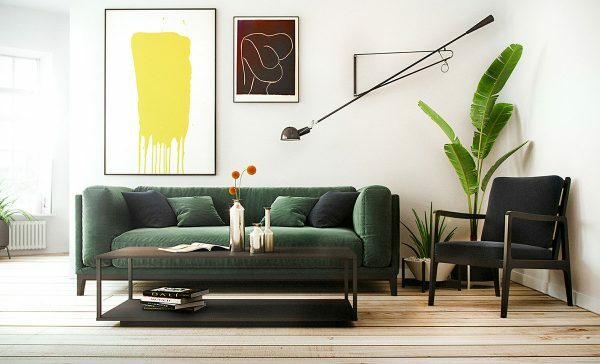 The designer floor lamp that lights a reading chair in the corner is the AJ floor lamp. 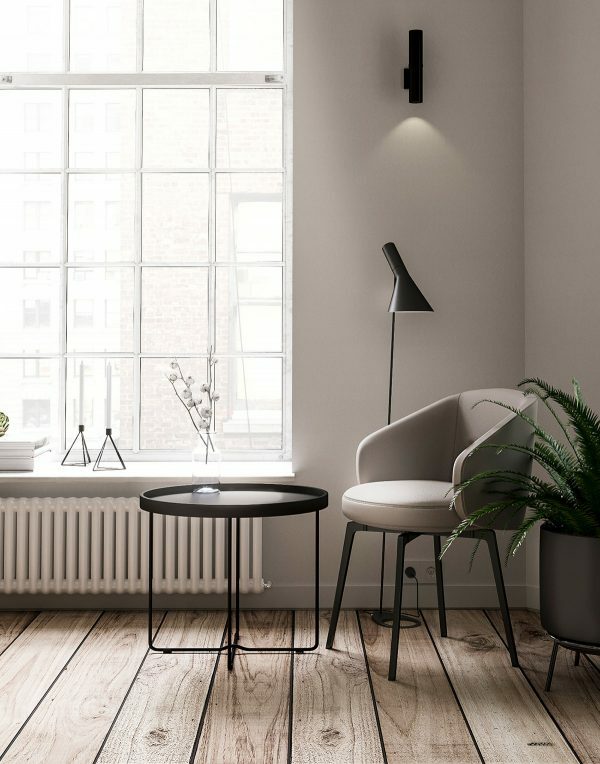 A black tray table matches the coating of the lamp and the chair legs. 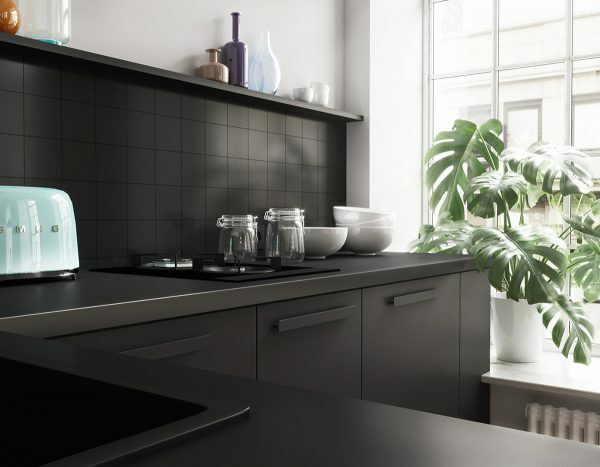 White ceramics and colourful glassware have been used to lighten the look of the solid black kitchen. 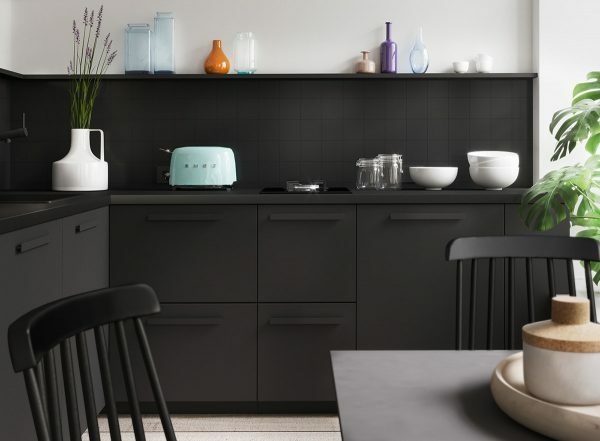 A duck egg blue Smeg toaster looks bright against the black tile backsplash. An arrangement of hallway furniture and a full length mirror create a useful entryway. 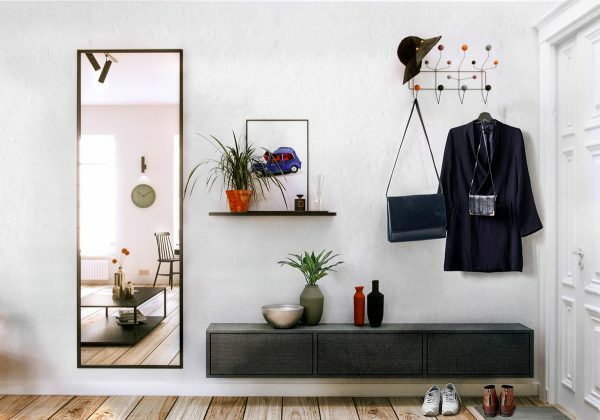 Ample storage and drop zones are provided by a stylish wall mounted console unit, a wall shelf and a decorative wall hook that you can get from here. 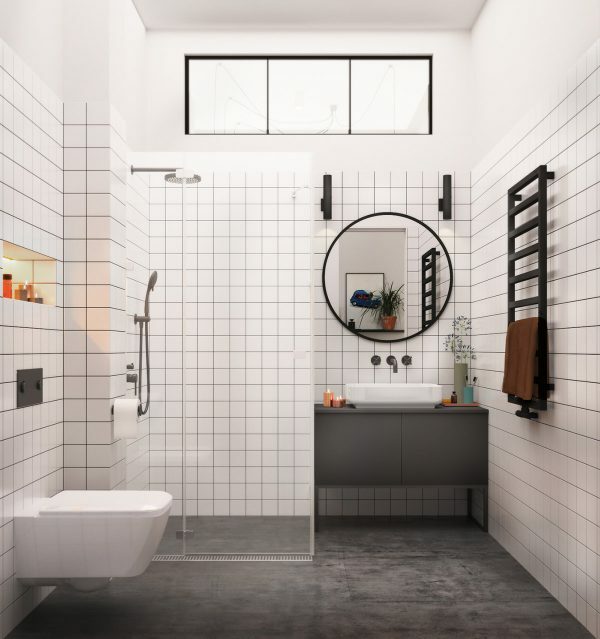 The grey and white bathroom has a trendy concrete floor. 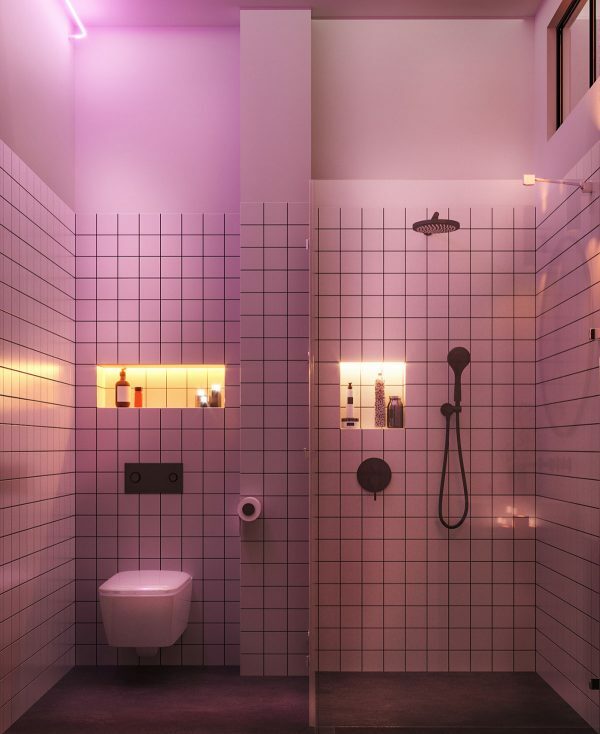 The look of the bathroom is transformed by modern wall sconces and coloured light. Tealight holders add twinkle to the vanity. 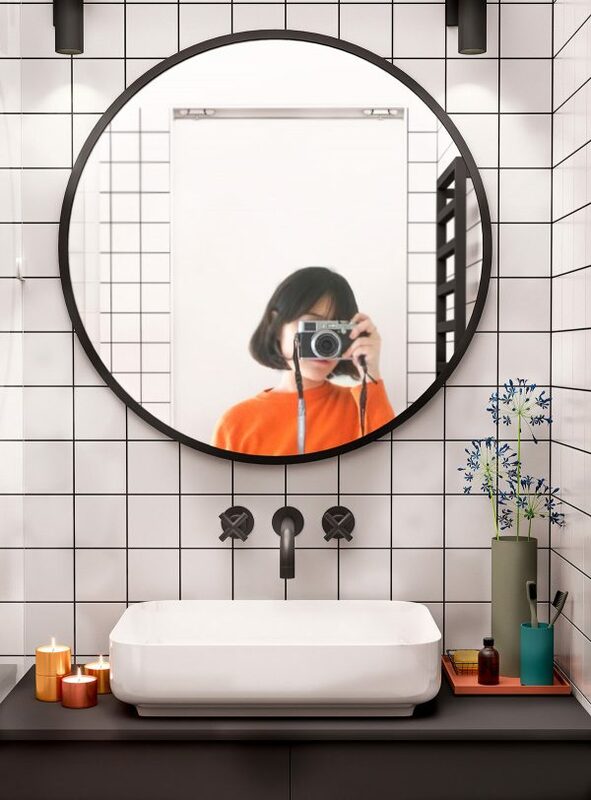 A black framed round bathroom mirror matches the black faucet. 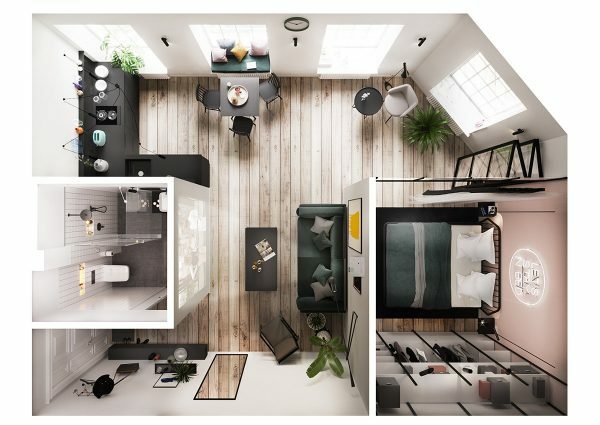 The one bedroom home plan shows how a small space can be divided to great effect. 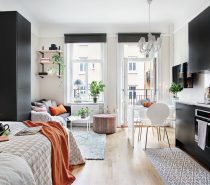 Our second studio apartment with a glass wall bedroom adopts an earthy palette. 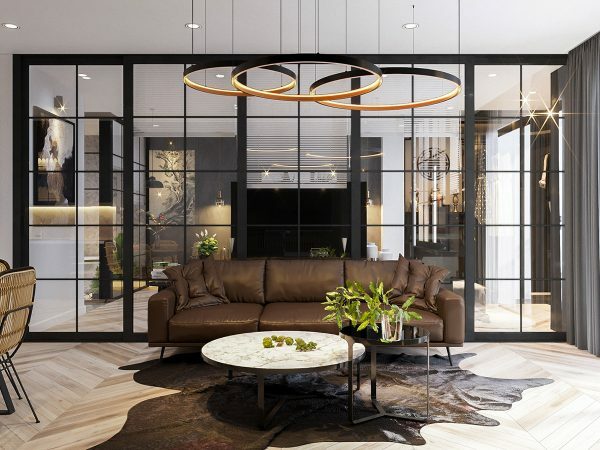 Two modern coffee tables stand in front of a brown leather sofa, set against a deep taupe wall. 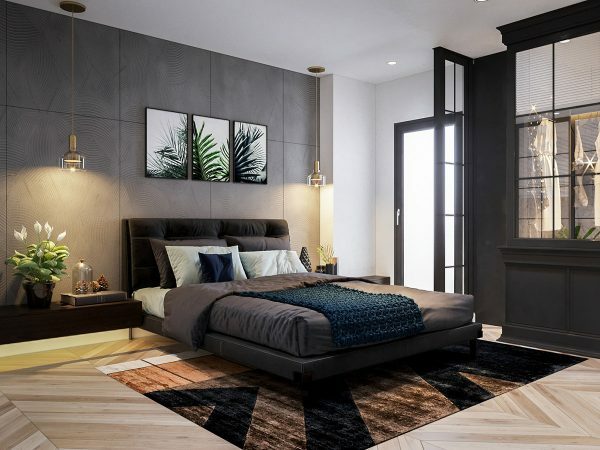 With a feline friend in the house, that bespoke platform bed could harbor some stylish cat furniture solutions, like hiding nooks. 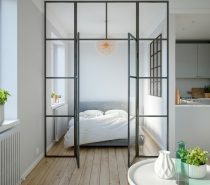 The glass bedroom partition does not reach the ceiling in this instance. The ceiling space over the lounge has a recessed lighting feature, in a rectangle shape that frames a central pendant light. 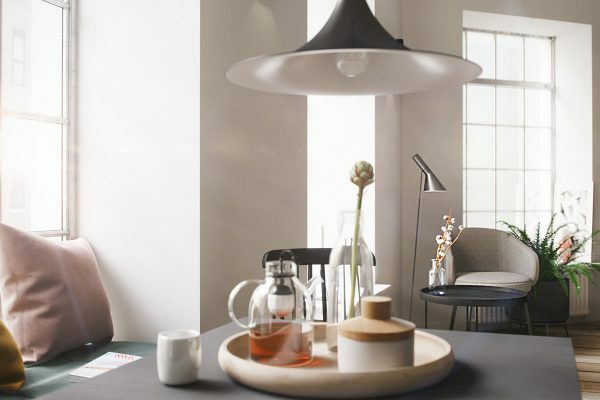 Two dining room pendant lights have a different design to mark the change of area and purpose. 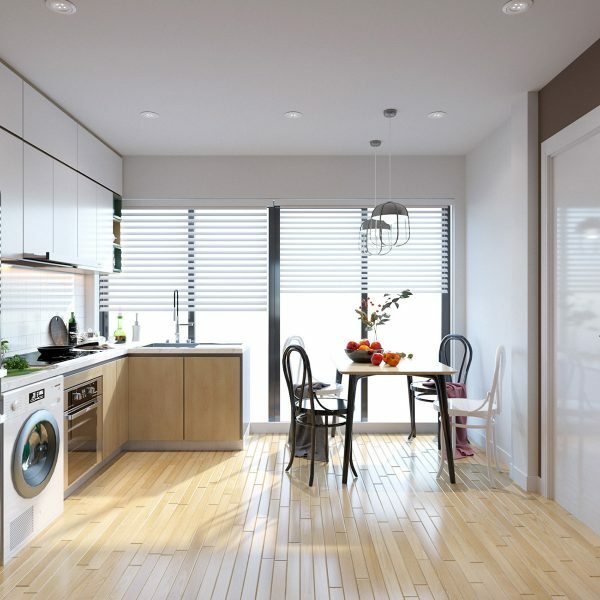 The dining set is a combination of white, wood and black finishes to complement the adjacent kitchen. 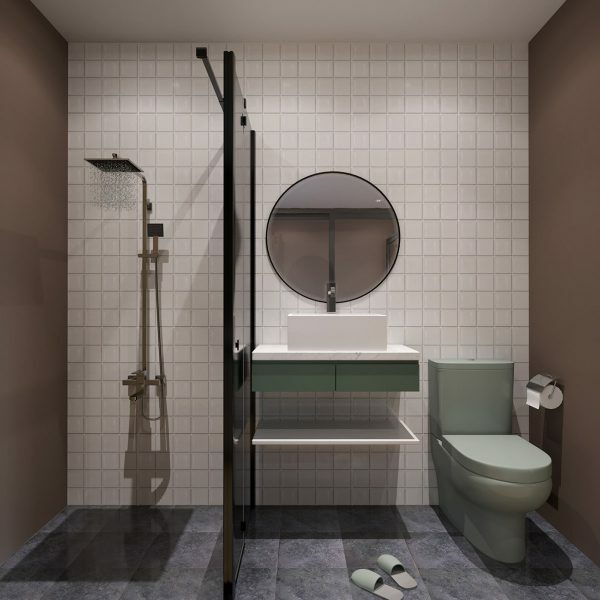 A light green vanity unit and matching toilet add an unexpected twist to the bathroom scheme. Concrete tiles cover the floor. Our third and last studio with glass bedroom installation is a slightly more grand affair. The glass bedroom wall makes a striking backdrop to a sophisticated lounge. 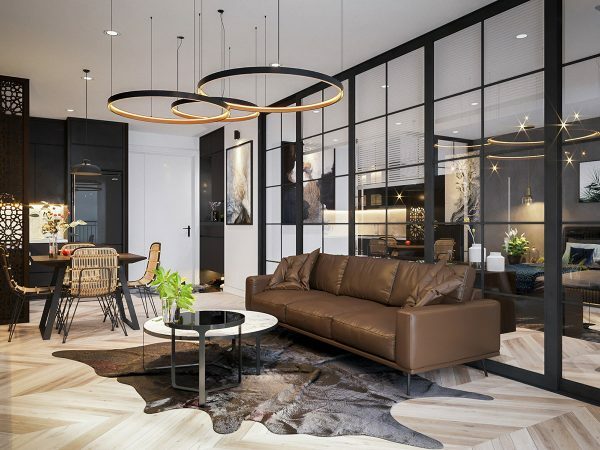 A high end modern chandelier hovers over a dark brown leather sofa and a sprawling hide rug. A black and white mid century coffee table set reflects the circular theme on the ceiling. 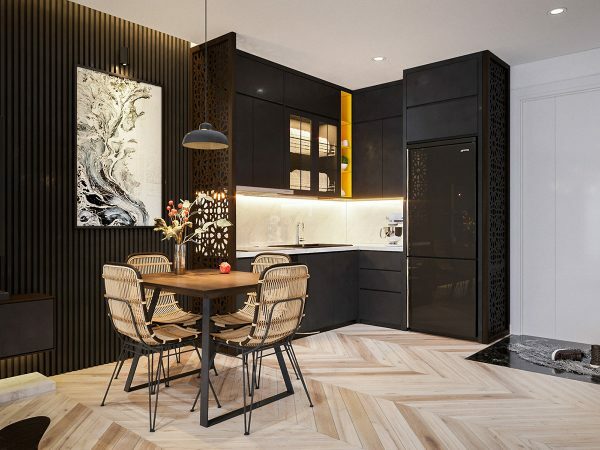 Sleek herringbone flooring runs seamlessly beneath the glazed divide. The heavy black framing of the glass wall adds drama, and intrigue as to what lies beyond it. Four outdoor style chairs border a more simplified square dining table. A slatted wall treatment decorates the dining room wall, and runs on as TV wall decor. A large piece of wall art anchors the dining set in its position, as does a simple dining pendant light suspended low over the tabletop. A narrow fretwork panel marks the start of the kitchen. 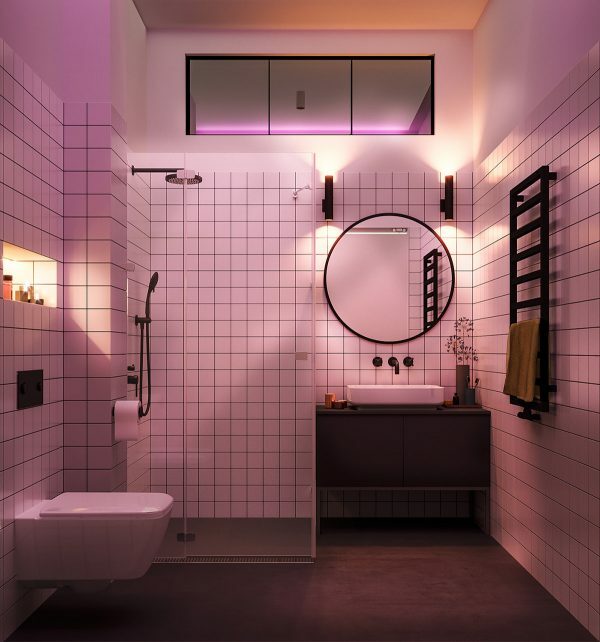 Black units form an L-shaped kitchen design, with one single bright yellow shelving unit set into the line of wall cupboards to break the dark plane. Two more fretwork panels provide visual stops at the other end of the open plan room. 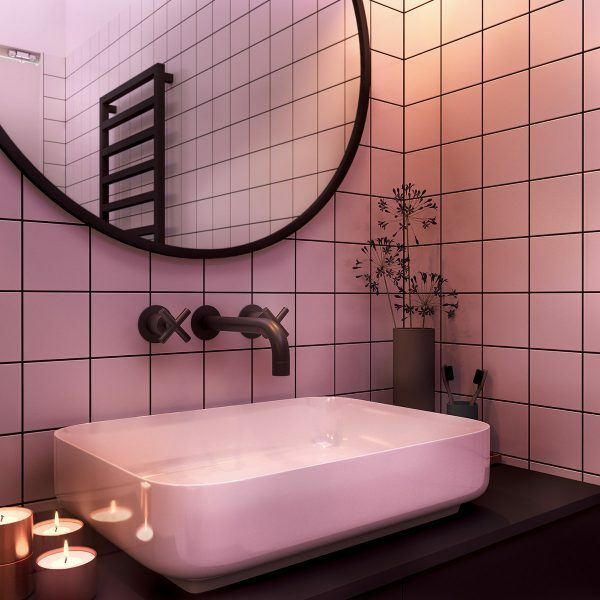 Black decor covers the bedroom. The dark scheme is lifted by the greenery of botanical artwork and indoor plants like the stunning peace lily plant on a bedside console. Glass bedroom pendant lights throw light over a concrete headboard feature wall. Venetian window blinds can be dropped to provide privacy in the bedroom when required. 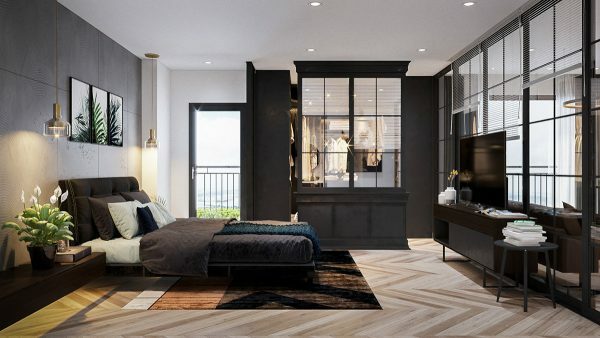 A glass closet resides at one end of the bedroom, accessed via open sides. 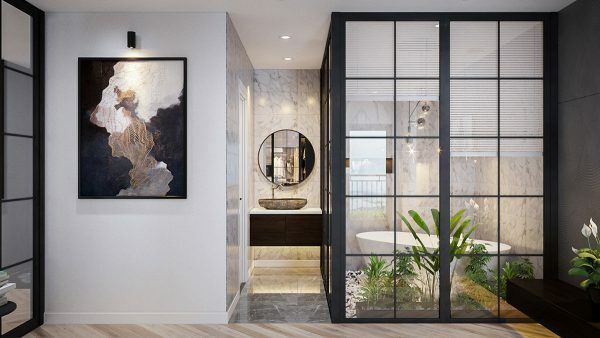 A glass wall bathroom continues the open glassy theme.